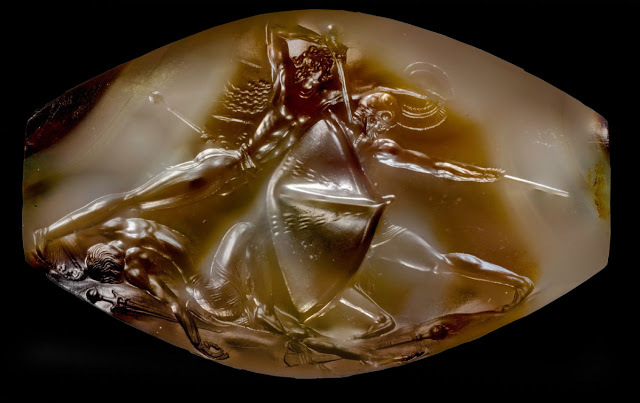 One year ago this week, articles in newspapers, magazines, and academic journals around the world began to appear, showing images of the amazing ancient artifact that has come to be called the Pylos Combat Agate, shown above. This hard gemstone was unearthed in a tomb discovered near the city of Pylos, on the west coast of the Peloponnese in Greece -- an ancient city, mentioned in the Iliad and the Odyssey. The tomb, a "shaft grave," was found in an olive grove outside the ancient ruin known as the "Palace of Nestor," and had apparently not been disturbed since being sealed, fully 3,500 years before. The tomb contained a complete skeleton of a male warrior, with armor and swords and over 3,000 artifacts -- including more than fifty "sealstones." One of these, the stone shown above, was initially encrusted with mineral deposits and had to be carefully cleaned in a process that took some months, but which revealed a scene of incredible artistic sophistication and detail. The artwork is even more astonishing because the entire stone on which the scene is engraved is only 37 millimeters in length! "Pylos Combat Agate is a 3500-year-old masterpiece of ancient art, technology" November 09, 2017. "Researchers Discover and Ancient Stone Carving So Detailed It Could Alter the Course of Art History" November 08, 2017. "This 3500-year-old Tomb Upended What We Thought We Knew About the Roots of Western Civilization" January 2017 (published before the Pylos Combat Agate had been cleaned off and thus "discovered"). A friend on Twitter alerted me to the articles describing this incredible discovery when these articles were first appearing, in early November, 2017. I immediately recognized that this scene, which had lain under the earth for 3,500 years (and which was executed with a level of detail and precision that astonished scholars and historians) was also remarkable for another reason. The scene on the stone can be shown to be based on specific constellations, using a system of celestial metaphor that informs other artwork from other cultures and other centuries -- indeed, even from other millennia! Part of the reason that the constellational connections in the scene were so obvious to me was that I had previously published discussions of the celestial connections in other scenes patterned upon the same constellations -- in books discussing the ancient myths, scriptures and sacred stories that can be shown to be based on celestial metaphor (such as Star Myths of the World, Volume Two: Myths of Ancient Greece, and Star Myths of the World, Volume Three: Star Myths of the Bible, both of which were published in 2016, before the existence of the Pylos Combat Agate became known to anyone living in modern times). 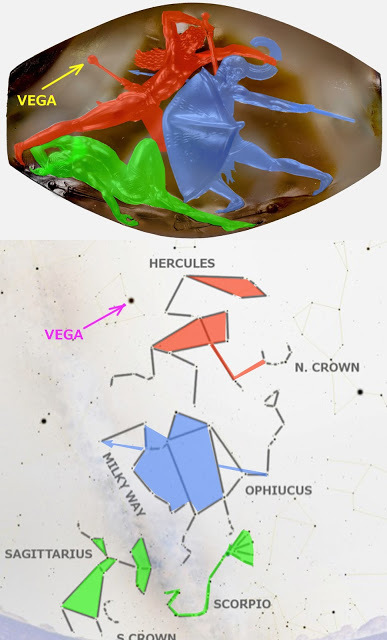 Believing that this connection would be of interest to scholars, I wrote an article describing the patterns in the artwork which match the characters in the scene to the constellations Hercules, Ophiuchus, Scorpio and Sagittarius in the night sky (as well as to the star Vega in the constellation of Lyra the Lyre). I sent this article to one scholarly publication after another, including those focused on art history, as well as those focused on ancient Greece and Rome. "The Pylos Combat Agate should radically alter our understanding of humanity's ancient past"
"Celestial correspondences in the Pylos Combat Agate connect it to myths and art from other cultures around the globe"
"New article on the Pylos Combat Agate available on Graham Hancock's website"
I also created a video illustrating the celestial connections in this ancient artifact, which I titled "The Pylos Combat Agate among the Infinite Realms" and which I embedded below. That video contains some footage showing the "sandy beaches of Pylos" mentioned in the Odyssey, as well as of the ruins of the grand edifice dubbed the Palace of Nestor, which is nearby to the grave site of the Griffin Warrior. You will see that specific details in the artwork on this ancient stone point to an undeniable celestial connection -- including the "extended leg" and body posture of the triumphant swordsman, the "overhead weapon" of that swordsman (matching the outline of the constellation Hercules in the night sky, who carries a weapon brandished overhead as well), and the grasping by that same swordsman of the crescent-shaped crest of the spearman's helmet with his other arm (matching the many myths in which a figure associated with Hercules grasps another figure associated with the crescent-shaped constellation of Corona Borealis, which is just beyond the downward-reaching "other arm" of the constellation Hercules in the heavens). 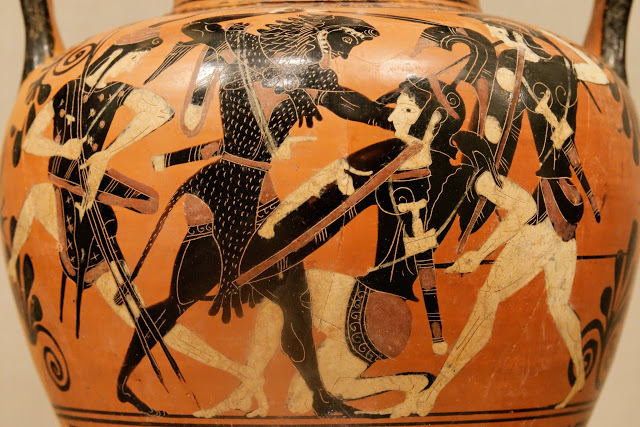 In all of these scenes, the figure of Heracles is associated with and depicted in the same general posture as the outline of the constellation Hercules in the heavens -- and is reaching out with his lower arm (the arm not brandishing a weapon) towards a crescent-shaped object, which is usually a helmet crest but can also be envisioned as the great curved horn of Achelous, and which clearly corresponds to the beautiful crescent-shaped arc of stars known as Corona Borealis, or the Northern Crown. And those are just a few of the correspondences (mostly those associated with the figure of the swordsman in the Combat Agate) -- many more can also be discussed, and these also have parallels to other artistic depictions of mythological scenes and figures from other centuries and other cultures. I would have thought that, given the importance of this archaeological find, and the radical revision of the conventional understanding of history that this artifact should engender, that the undeniable parallels between the scene on the Pylos Combat Agate and the constellations of the night sky (as well as undeniable connections to other artwork from other cultures, depicting other figures based on those same constellations, including David slaying Goliath as described in 1 Samuel and as depicted on artwork from many different centuries, and Hercules or Heracles slaying a variety of opponents as depicted in literally hundreds of pieces of ancient Greek pottery) would be of interest to scholars and art historians, as well as to some of the same publications that were interested in the discovery of the Combat Agate in the first place. Thus far that does not seem to be the case. There seems to be a widespread reluctance on the part of academia to investigate certain lines of inquiry, despite overwhelming evidence which points in those directions. I remain confident, however, that the truth will not remain suppressed forever.